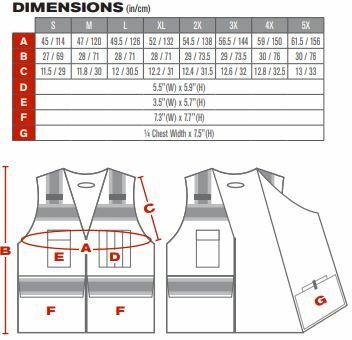 The 302-0800D by PIP is a Class 2 high visibility two-tone surveyors vest which features 11 pockets. This vest is made with 120 g/m² 100% polyester mesh features zipper closure and D-ring access. A padded neck is featured at top while grommet at the neck are there to for tool keepers and lanyards. A variety of 11 pockets are found throughout the vest: 2 internal, 1 chest with 4 pen pockets on left chest, 1 tablet pocket, 2 lower pockets, 1 large back pocket with snap closure. ANSI Class 2 Standards are me with 2" silver reflective tape which has a contrasting black trim.